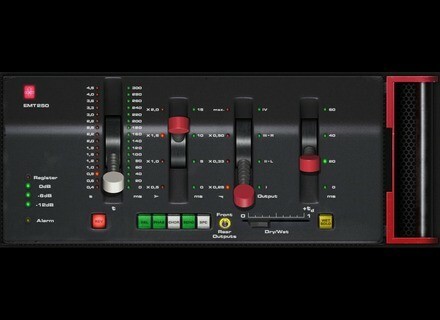 EMT 250, Software algorithmic reverb from Universal Audio in the UAD Plug-In series. loudfunk's review"The EMT 140s bigger brother..."
As with all U-audio, no issues to report. The EMT 250 was the first digital reverberation device to create ambience through a purely electronic system. With its single reverb program and iconic lever-driven control surface, the EMT 250 is still an indis- pensable tool within the record-making elite and is widely considered one of the best-sounding reverbs ever made. Although only around 250 were built, the EMT 250 has made an immeasurable impact on record making history in the hands of studio legends like George Massenburg, Bruce Swedien, Allen Sides and many others. Captured from Allen Sides’ unit at Ocean Way Re- cording, endorsed by EMT Studiotechnik GmbH in Germany, and re-engi- neered for plug-in use by EMT 250 creator Dr. Barry Blesser from his original documentation, the UAD version of the EMT 250 goes beyond emulation and is the very same algorithm found in the original units—for a fraction of its orig- inal $25,000 price! Besides the coveted reverb program, the EMT 250 for UAD provides the five additional effects (Delay, Phasing, Chorus, Echo and Space) also included in the original unit. Lighted pushbuttons select the desired program, while four click-stop levers provide the primary reverb parameters of delay time, prede- lay, and high and low Filtering. LED ladders provide additional visual rein- forcement of program selection and parameter positioning. Like the hard- ware, the plug-in operates in “quad,” with two discrete stereo output pairs accessed through the added front/rear output switch. Additional “digital only” features include dry/wet mix, wet solo, reduced noise (if desired), and hard bypass via the EMT power icon. All input and output characteristics of the EMT 250 are fully emulated in the plug-in. This includes all of its idiosyncrasies, such as the A/D and D/A anti-aliasing filters (which are not linear-phase), system latency, input clip- ping, and limited frequency response. All these quirks embellish the unique sonic signature. I can't say too much about the installation process with the Universal Audio EMT 250 as it was already installed on the system that I used it on. However, I don't know about any installation or compatibility problems if there were any. The interface of the software isn't complicated as you've got only simple parameters to work with. There are a few sliders to set the time of the reverb, as well as the output level and the mix. There are also some other effects like chorus, echo, and phasing. Even those without much experience with reverb plug-ins should be able to get the hang of using the plug-in rather quickly as there isn't anything out of the ordinary here. I don't think a manual is necessary for this reason, but haven't seen one so I can't say anything about its make up.